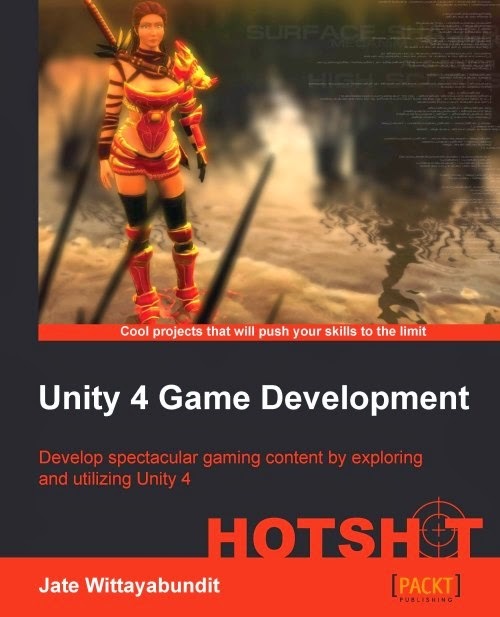 Unity 4 Game Development Hotshot is another interesting book about game development in Unity3D. In my opinion its book was written probably for developers who'd already got some minimal experience with the environment. It's not a problem and can be fixed in some hours with first steps learning. So if You know Unity basics, You can easily continue Your way of developers samurai with the book. In the beginning it shown how to easily manipulate with 2D objects while making 2D platform game, so reader gets important knowledge about interaction of the game elements in the game world. Author tells how to work with sprites, spritesheets, sprite animations, and 2D physics and gives some useful advice by the way. Another important aspect of the book is working with user interface. I have to admit that chapter about shading was the most interesting to me because it's still missing subject in my skills and still can't make myself to learn it :) So this book told me quick tutorial with shading basics and theory. The book continues with 3D theory and shows how to create shooter-like game. It tells about general and peculiar for Unity3D game development techniques and their implementation. You can find many code examples and step-by-step tutorials. In conclusion I would like to say that book highlights sugar of game development in Unity3D and helps beginner developer to study basic aspects in short time. In my mind this book misses chapter about basic optimizations techniques and its implementations, despite this full enough of useful information. Also topics selection might be considered a bit weird and topics are well covered and it keeps the book of becoming too huge. Pretty nice, recommended.